How “Radical” is the Ryan Budget? President Barack Obama chose an appearance before the American Society of News Editors on Tuesday to provide his critique of the budget that was passed by the Republican-controlled House of Representatives – led by Budget Committee Chairman Paul Ryan (R-WI) – on an overwhelmingly party-line vote. In his remarks, the President outlined his opposition to the plan in stark terms. Denigrating what he called “trickle-down economics” and calling the budget a “radical vision”, he accused Ryan and the Republicans of attempting to “gut education” and “take away people’s financial aid”. Referring to what he called “massive new cuts”, he went through a litany of specific things he said would happen if the Ryan budget were enacting, from less accurate weather forecasting and fewer on-time flights to student loans and FBI agents. He painted a stark picture of a future where the weak, poor, and elderly are left behind and where corporations and the rich control the country. So how “radical” is the Republican-backed budget? Does it actually constitute what the President called “Social Darwinism”? Let’s look at the numbers. The House GOP budget proposes spending $3.6 trillion in 2012, rising to $4.9 trillion in 2022 (of course, a new budget is developed each year, so 10-year projections are just that: projections). 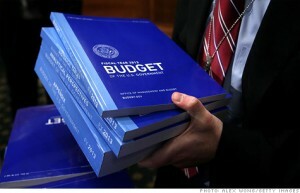 President Obama’s proposed budget is $3.8 trillion in 2012, rising to $5.8 trillion in 2022. Neither proposal seems to contain “sharp” or “drastic” cuts, since both increase over 10 years; only in Washington is an increase of $1.3 trillion dollars considered a “cut”. The difference between a “balanced approach” and “Social Darwinism” is apparently only $200 billion this year and $900 billion 10 years from now. Over those 10 years, Ryan proposes spending a total of approximately $40 trillion dollars; the President proposes spending approximately $47 trillion. Perhaps even more telling, however, is a comparison to budgets in the past. Using the official historical budget data available from the Congressional Budget Office, population numbers from the US Census Bureau, and the inflation calculator provided by the Bureau of Labor Statistics, it is easy to calculate what government spending in past years would be in 2012 if we spent the same per person in constant dollars. The results are quite interesting. Alluding to GOP Presidential contender Newt Gingrich’s signature plan in the 1994 elections, he proclaimed the Ryan budget “so far to the right it makes the Contract with America look like the New Deal”. The Contract with America was a reaction to what was seen at the time as a severe move to the left by the Democratic Congress and President Bill Clinton. That backlash resulted in Republicans taking control of the House of Representatives for the first time since the 1950s. The 1994 budget against which Republicans campaigned was approximately $1.5 trillion dollars; correct for inflation and population, and that budget for 2012 would be only $2.7 trillion – $900 billion less than Rep. Ryan’s 2012 budget. Is President Obama calling people like Harry Reid, Nancy Pelosi, and Bill Clinton “Social Darwinists” for their parsimonious hold on the purse strings in 1994? Fast forward to the year 2000, when President Clinton presided over his last budget and the federal government had turned deficits into surpluses. That year, the Clinton Administration spent a little less than $1.8 trillion; adjusted for 2012, that would be around $2.4 trillion. Again: were Clinton and the then-Republican House and Senate “radical”? Was 2000 a year of abject poverty? Finally, since President Obama referred to the New Deal, let’s look at Roosevelt’s budgets. It probably wouldn’t be fair to judge FDR’s spending during World War II, so we can look at the height of New Deal spending: the 1938 budget spent a whopping $6.75 billion. Again using official government figures for population and inflation, that would translate into spending of only $263.1 billion in 2012 – about the difference between the respective proposal of Ryan and Obama. Obviously, such comparisons aren’t exactly apples-to-apples. Our demographics are much different, and the 9/11 attacks rekindled military spending that had declined in the post-Cold War 1990s and hadn’t yet ramped upward in 1938. Baby boomers are starting to retire, putting new strains on Medicare and Social Security. The federal government is more firmly rooted in nearly every aspect of life in a way that even Franklin Roosevelt never imagined. However, if the President is going to tout as criticism of the proposed budget “investments that were made in the ‘50s, and the ‘60s, and the ‘70s, and the ‘80s”, he should at least realize that Ryan is proposing even more “investments” than were made in any of those decades. If he’s going to accuse Republicans of “pulling up those ladders up for the next generation”, he should be honest about the budgets that drove the economic success of the 1990s — and were presided over by a Democratic President who remains popular today. Compared to historical federal spending, the Republican budget is radical – just not in the way the President means. Sponsored: Between thousands of emails to read, and untold number of hours out of the office, it is harder to get a potential client’s attention now more than ever. New free report helps you do just that. Email info@usabusinessradio.com and put “free report” in the subject line.